Today is Valentine’s Day. Sunday is National Random Acts of Kindness Day. Yes, there really is such a thing. 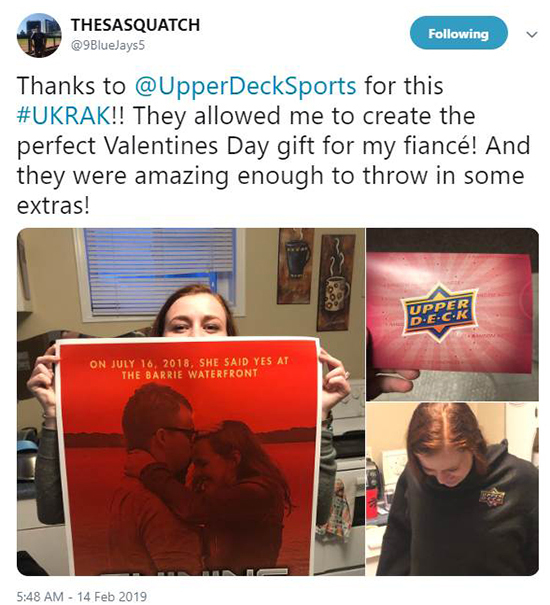 So our Customer Care team wanted to take a little time to give back to some great fans with some fun and unique mail days that just arrived Here are some of the highlights from the Valentine’s Day edition of #UDRAK! Tyson told us a story about how his wife always supported his love for the hobby. He thought it would be cool to make a custom card to celebrate their love and guess what, so did we! We even included Upper Deck Snuggies so they really felt a warm and fuzzy feeling about their favorite card company. 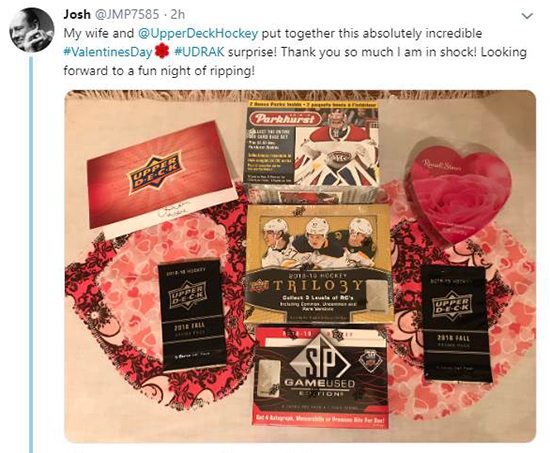 Sara’s husband Josh loves Upper Deck products. Today they celebrate their 2 1/2 year anniversary and since their local hobby shop is over an hour away, we thought it would be fun to deliver some product for him to crack open on this special day. He loved it! Noah loves collecting hockey cards, but his friends aren’t that into it. 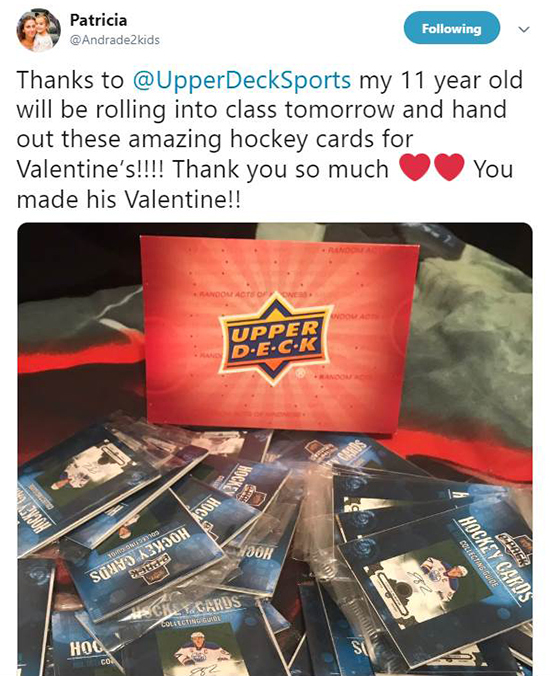 Noah’s mom reached out to us and we put together packs that Noah could share with his classmates on Valentine’s Day to encourage them to collect too. 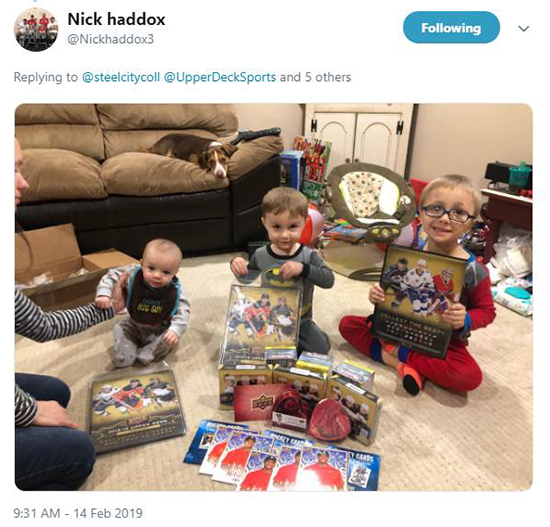 Hopefully he gets some new trading buddies out of this one! Melinda’s husband and son are both avid collectors. 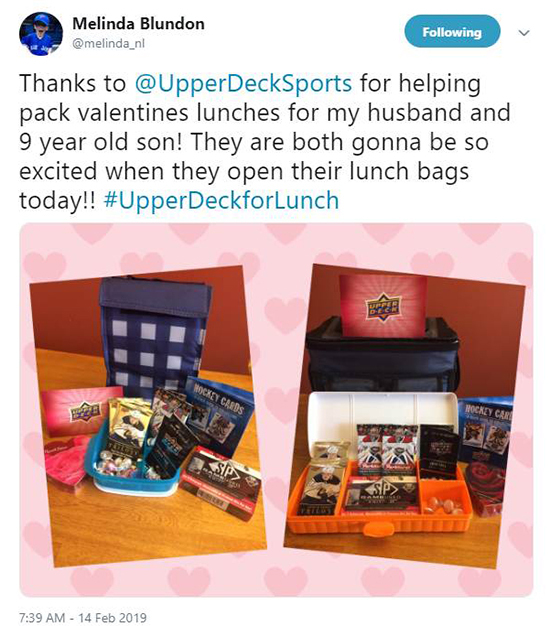 She had a fun idea of packing Upper Deck cards in their lunches as a Valentine’s Day surprise and we were totally on board. They had quite the surprise when they opened their lunches today and saw the collectible love Melinda shared with them! And then you have the #UDRAK mail day to the Pack Geek from his wife who was looking for a great gift for her card collecting hubby.